Do you sell products that require certain specifications? Product variants function will help you out. Variants are parallel to the pricing variants. However, unlike the pricing variants, the price remains unchanged. How to create product variants? 1. First of all, you need to create an Additional field, to assign the variants to, in the part SETTINGS / Product / Additional fields. Instructions for the Additional fields: Additional fields. If you have already created the additional fields forms, omit this step. 2. Create a new variant. Go to the section SETTINGS / Products / Product variants. Here you can create the new variables using the icon Add a value. A new variable field appears in the list, you can insert the variable name. The order of the variables can be modified using the blue arrows; the red cross deletes the variable. variants within the Fabrics additional fields group. 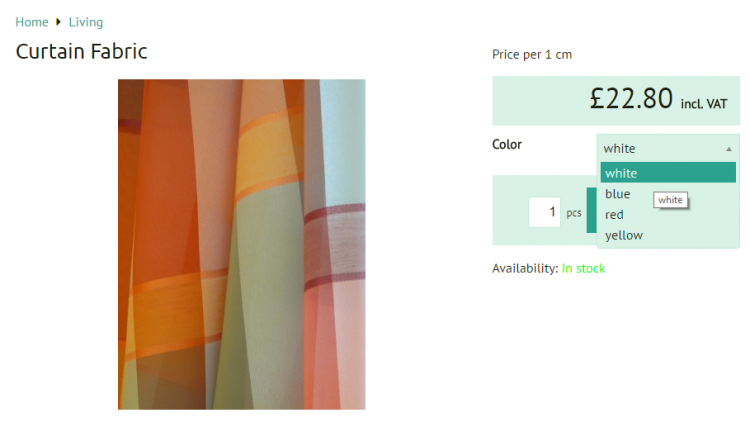 You assign the Fabrics additional fields group to the Women´s clothing category in the section Category characteristics. As a result, the Size and Colour variants will appear in the section Prices of every single product in the Women´s clothing category. You can modify the variants afterwards. 4. Setting the product variants. The window EDIT the product opens. In the section Prices select the part Variants. The variables assigned to the variant in the previous step are shown in the section Variants. by clicking on Activated check box. E.g. you have T-shirts in white, blue, red, yellow on the stock, but not in brown, black and green. You activate the available colours. Only the activated variants will be shown online. You can higher the variant price in the column &quot;additional charge&quot;. Once you click on the field, you can insert the additional charge to be added to the original product price. The additional charge will be added to the original price once the customer chooses a product variant with an additional charge assigned. You can create as many variants as you want. Always proceed in the same way. You can set the display when editing the variants. Choose a variant from the list and click on Edit icon . Choose the display type you want to use.